Kaijumax may look silly on the surface, but don’t be fooled by the cartoonish aesthetic and the seemingly irreverent concept of a prison drama starring giant monsters. 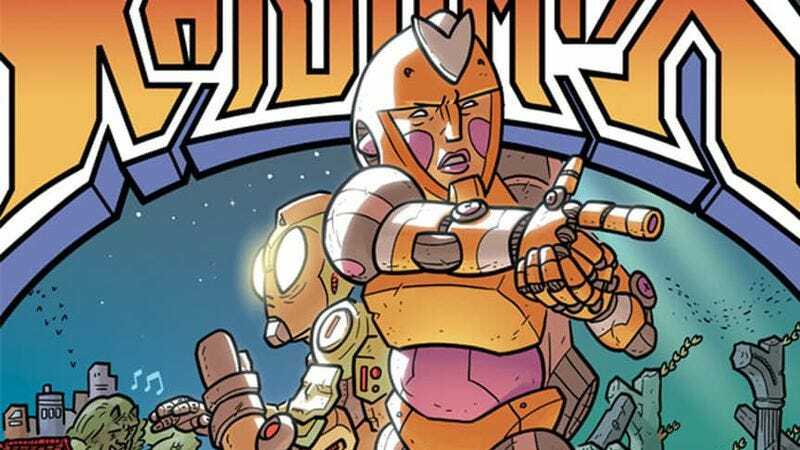 The story is driven by sorrow, alienation, and rage against an oppressive system, and while there are plenty of moments of humor, Kaijumax goes to some very dark places. The first six-issue “season” focused on the prisoners and guards on the Kaijumax island, establishing the complex web of personal relationships and species alliances that provided a steady stream of fraught drama. The book features a large ensemble cast, but the reader is initially introduced to the prison through the experience of Electrogor, a new prisoner who has been taken from his two children and thrown into a place where he’s broken, used, and abused. Electrogor’s desire to get back to his family motivates him to orchestrate a nuclear disaster on the island so that he and his friend, The Green Humongo, can escape. Kaijumax: Season Two significantly expands the scope of the series as the fugitives make their way to the city to meet up with The Red Humongo, who is currently on parole after leaving Kaijumax. Much of the action takes place away from the prison, allowing Cannon to delve deeper into different aspects of this world and explore new themes in his script. He gives more attention to the humans and robots that fight the kaiju, and there’s an especially compelling plotline involving the budding relationship between the robot Chisato and former Kaijumax prison guard Jeong. Bigotry and racism are major themes in season two as Cannon explores what the world is like for kaiju living among the humans. They are constantly reminded of their otherness by a deeply segregated environment filled with humans that treat them as lesser beings. The kaiju function as a symbol for marginalized groups of people, but there is some uncomfortable racial space to navigate by connecting these groups with giant monsters driven by primal urges. This is less disconcerting in the first season, because the conflict is more focused on the lines drawn between different species of kaiju, which are rooted in the racial alliances made in prison but don’t have exact correlations. Once the story ventures outside of prison, the racial metaphor becomes more complicated. The conflict in season two is primarily human vs. kaiju rather than kaiju vs. kaiju, and exploring the concept of racism is tricky when the oppressed group is giant monsters, representing a genuine, immediate threat that different races of humans do not. Season two makes a more explicit connection between the kaiju and black Americans, but while it can be considered a commentary on the racist belief that black people are dangerous, the kaiju actually are extremely dangerous. Kaiju aren’t allowed to do a lot of the things that humans do because they are physically unable to do so, and if they tried, it’s more likely than not that people would get hurt. That’s not to say that kaiju shouldn’t be treated with respect, but they have to take the kaiju entrance in back because their bodies don’t fit through a human door. They can only have kaiju takeout because they can’t fit in a restaurant. They’re more likely to be stopped by the police because they could kill a bunch of people if they step the wrong way. There’s a logical reason for keeping humans and kaiju apart, which ultimately muddles the racism metaphor, but Cannon still makes an effective statement on how human beings treat people that they consider to be “other.” The pain and isolation these kaiju experience in the face of xenophobia and bigotry lands with heartbreaking impact, and a general ignorance regarding the nature of kaiju and their behavior prevents humans from trying to form a mutually beneficial relationship with these creatures. I saw an Electrogor stuffed animal at C2E2 last month; seeing Cannon’s design in this context reinforced how adorable and nonthreatening his visual style is on first impression. This exaggerated, cartoony approach may seem at odds with the darker elements of the story, but it actually enhances them by creating an unsettling tension between the visuals and the narrative and allowing for extremely expressive characters. This is a story about beings with big emotions, and there’s very little that is understated in Cannon’s artwork. There are quieter moments of melancholy, but even then Cannon is heightening the stillness and sadness. It’s easy to connect with these characters because there’s so much care put into exploring the depth of their feelings, and Cannon does exceptional work creating personal stakes for a narrative that is huge in scope. Cannon writes, draws, colors, and letters Kaijumax (with coloring assists from Jason Fischer), the series showcasing the broad range of his talent as a creator. One of the most delightful aspects of Kaijumax is how Cannon plays with scale in his artwork. Working with giant characters forces him to come up with clever ideas for settings and props. The very scene of season two is a great example of this, introducing readers to The Red Humongo’s morning routine in his abandoned train station home. He uses a balcony as a sink, a windmill blade as a razor, the roof of a gift shop as a shelf, and a news station as his phone with a news truck as the receiver. The series is filled with details like these, and it shows how much thought has gone into the development of this world. Kaijumax delivers huge kaiju vs. mecha battles that rain destruction on a city skyline, but my favorite action sequence in this season comes during chapter four when Chisato and Jeong chase down a kaiju prostitute on the street. The scene features expert use of the nine-panel grid to create clear, concise movement. It begins with a nine-panel page that sets a specific rhythm for the action, building to a dramatic shot of Chisato running along the side of a wall just before the perp crashes into the palm of Jeong’s mecha. The goofy look on the prostitute’s face maintains an element of comedy throughout, and the outline that face leaves on the mecha palm adds a great visual punchline to the end of the scene. Kaijumax: Season Three begins in July, and I highly recommend that readers check out this series in single issues, which contains letters from readers with responses from Cannon, capsule reviews of different tokusatsu movies, and occasional personal essays that provide insight into the creative process. The capsule reviews, some of which have a direct connection to the contents of the issue, provide a lot of valuable context for readers who don’t have a deep knowledge of kaiju cinema. For example, the review of Gamera Vs. Viras discusses the relationship between kaiju and children, which informs the issue’s narrative involving the Kaijumax’s prison administrator and the kaiju she betrayed when she was a girl. This is material that isn’t collected, and readers who want the full Kaijumax experience should jump on the series when it comes back in two months.